The holiday season is upon us, and if you are anything like me, you’ve got a long list of people you’d like to remember this year! I’m a firm believer that it is the thought that counts, and I also love the idea of giving something homemade and edible instead of just more STUFF! (Because let’s face it–the last thing most of us need is more stuff! But what happens when you don’t have enough time to bake (or when baking isn’t really your thing?) 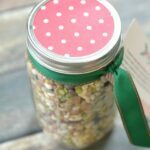 Wouldn’t it be nice to have some sort of food gift alternative that doesn’t require hours in the kitchen? 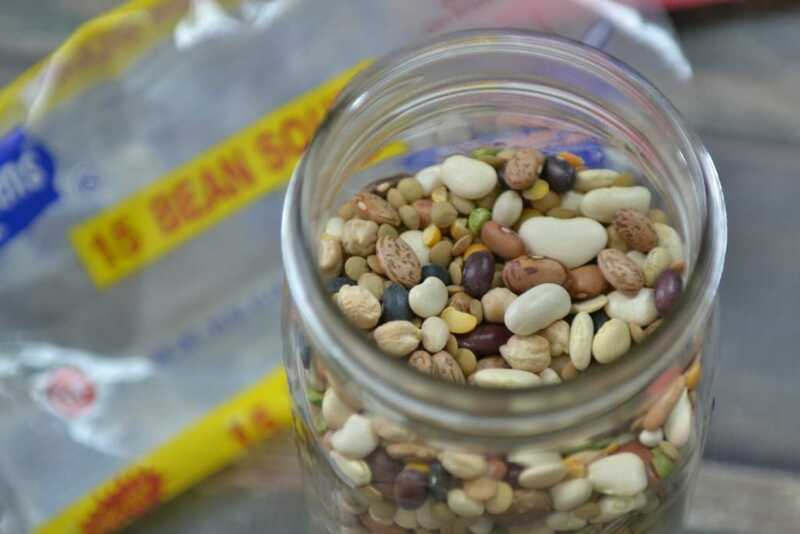 Enter the 15 Bean Soup Jar. It’s cute, it’s useful, it’s inexpensive to make, and it literally comes together in minutes. Seriously–what more do you need? 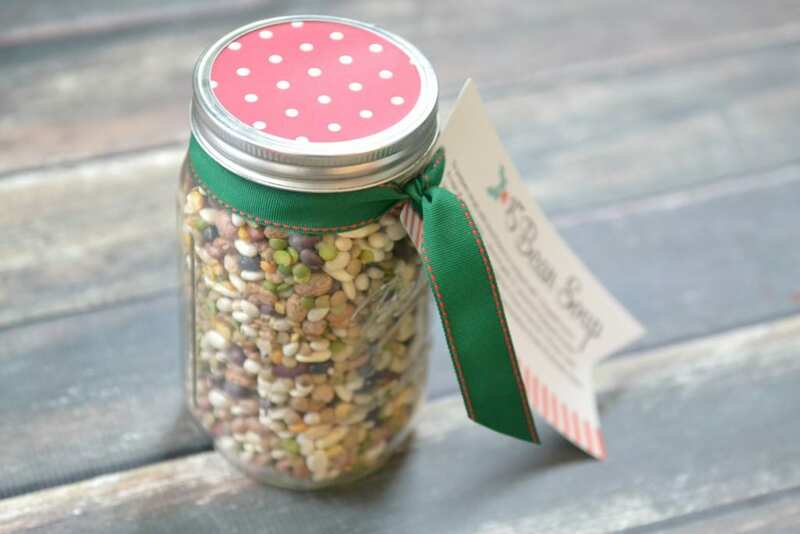 And while the bean jar on it’s own makes a great gift, you could also present it in a cute basket with the additional ingredients–smoked sausage, an onion, garlic, & can of tomatoes for a complete meal on the go. 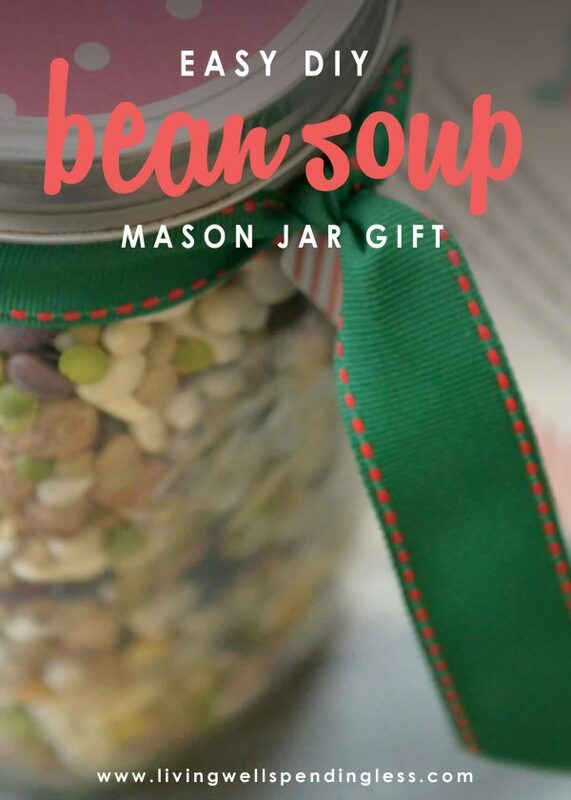 Oh, and there is also a vegetarian version of the 15 Bean Soup available as well, just in case your giftee doesn’t eat meat! 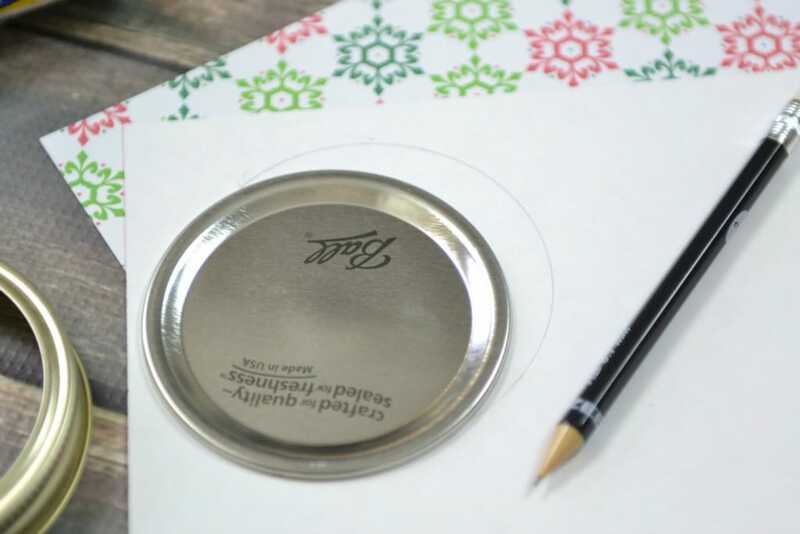 Step 1: Trace the canning lid on the back of your scrapbook paper, then cut out circle. 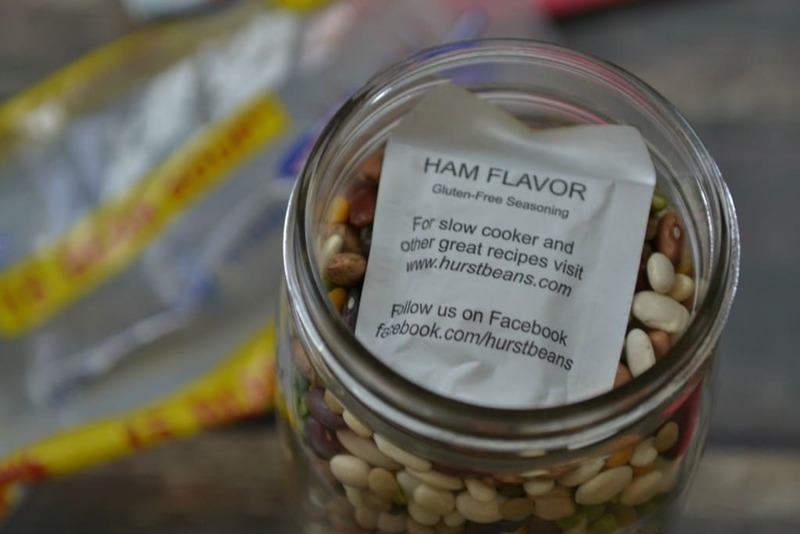 Step 2: Fill jar with beans. Step 3: Place seasoning packet on top of beans. 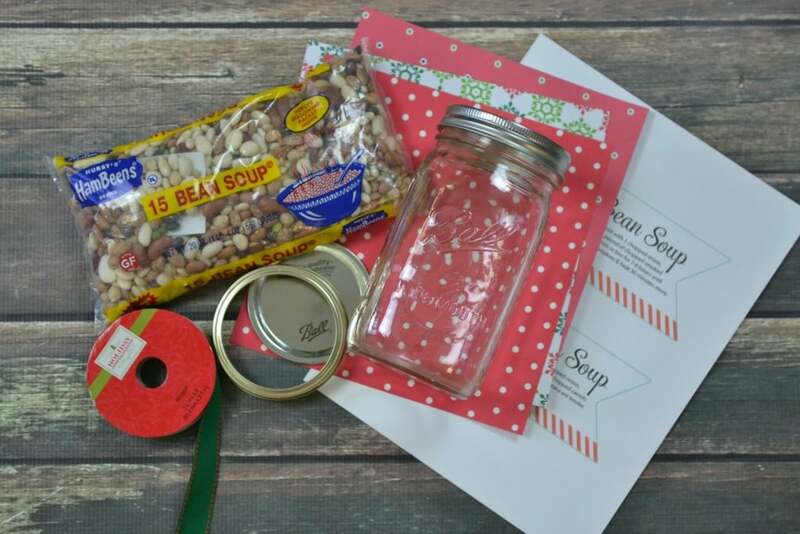 Step 4: Place canning lid on top of jar, then cover with scrapbook paper circle and secure with canning ring. Step 5: Secure tag with cooking instructions to jar with a pretty ribbon. Step 6: To prepare soup, simply simply add rinsed beans to crockpot with 1 chopped onion, 8 cups of water or stock, 1 clove garlic, & 1 pound chopped smoked sausage or cooked ham. Cook on high for 5 hours or low for 7-8 hours until beans are tender. Stir in 1 15oz. can diced tomatoes & heat 30 minutes more. Serve with crusty bread. For a vegetarian version, omit the meat & add 1/2 cup each of chopped carrots & celery instead. 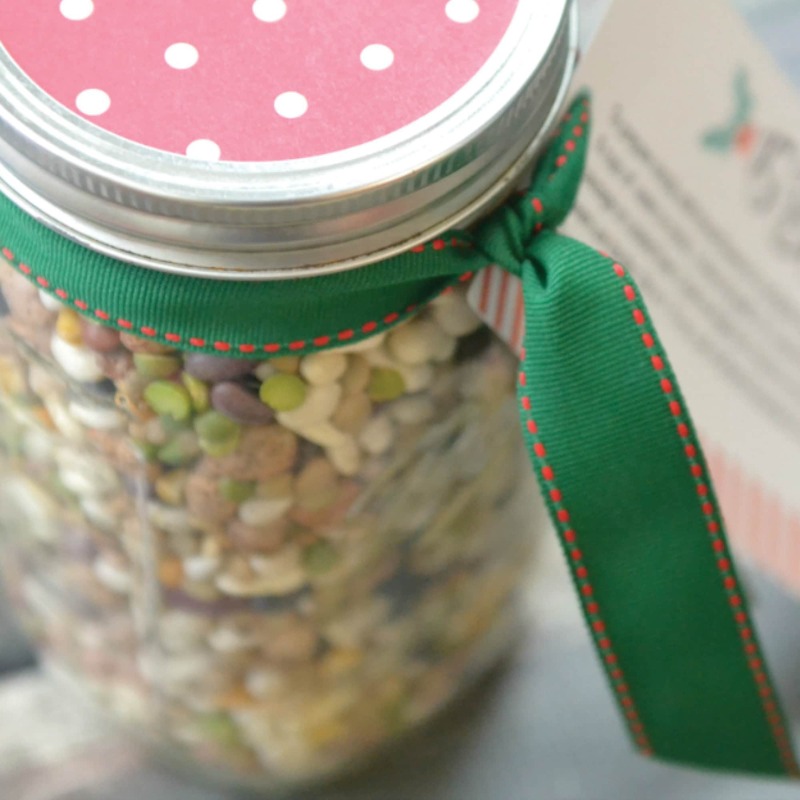 This simple and practical gift is perfect for teachers, neighbors and friends! Trace the canning lid on the back of your scrapbook paper, then cut out circle. Place seasoning packet on top of beans. 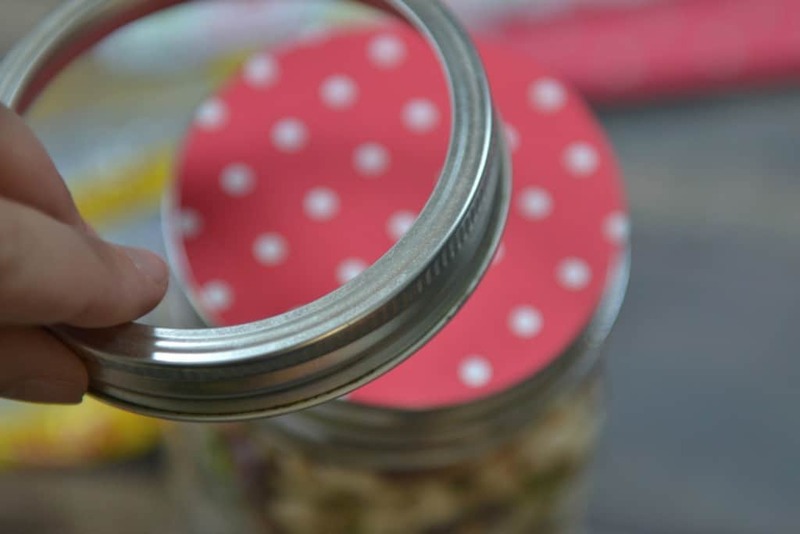 Place canning lid on top of jar, then cover with scrapbook paper circle and secure with canning ring. 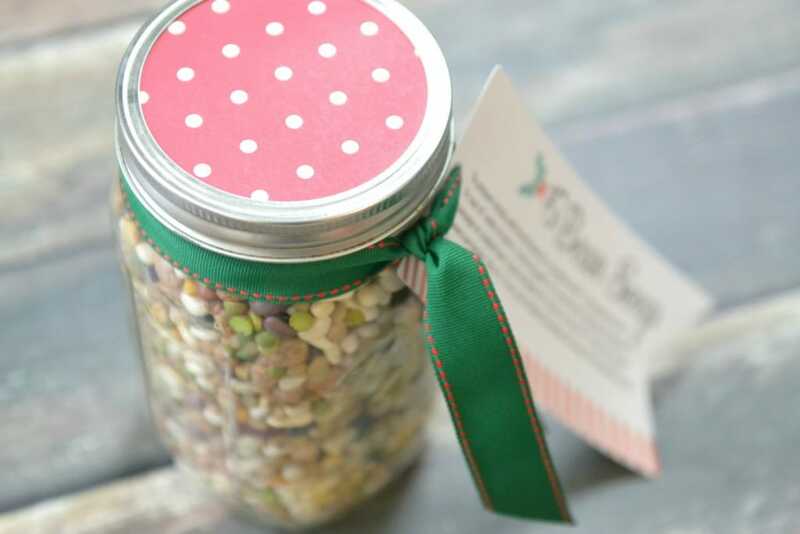 Secure tag with cooking instructions to jar with a pretty ribbon. 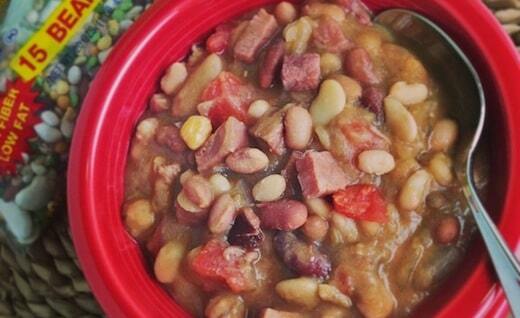 To prepare soup, simply simply add rinsed beans to crockpot with 1 chopped onion, 8 cups of water or stock, 1 clove garlic, & 1 pound chopped smoked sausage or cooked ham. Cook on high for 5 hours or low for 7-8 hours until beans are tender. Stir in 1 15oz. can diced tomatoes & heat 30 minutes more. Serve with crusty bread. For a vegetarian version, omit the meat & add 1/2 cup each of chopped carrots & celery instead. I made 15 bean soup mixes for my extended family one year! I used my own spice mix and those cute cellophane bags for cookies instead of jars (less expensive to ship). They were a big hit! Could I rinse and dry the beans ahead of time? I would like to add some dried veggies to the beans! It does help, thanks so much!